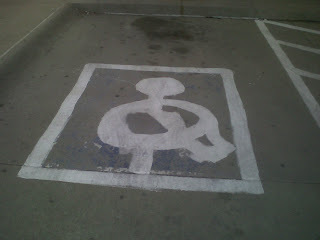 I know there are handicapped spaces for drivers, but are there handicapped spaces for painters of handicapped spaces? Much thanks to Nick Zachariasen for pointing out the challenges of parking. Did I send that to you? I could swear I've seen it elsewhere, but that might have been seeing it in person. It almost looks like a skull near the top of a flagpole.